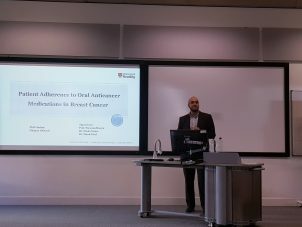 The winning presentation by final year PhD researcher, researcher, Othman AlOmeir, at the PhD Pharmacy Conference, April 2019, Henley Business School, University of Reading. Background: Depending on the researchers’ epistemological position, meta-syntheses of qualitative studies have used different approaches that include grounded theory synthesis. Numerous stand-alone qualitative studies have examined non-adherence to long-term hormonal treatment in breast cancer but no qualitative synthesis on this topic existed. Objective: To theorise about why and how women experience non-adherence to hormonal treatment in breast cancer using published qualitative reports. Methods: Qualitative reports were retrieved using 10 databases that included PubMed, CINAHL and PsycINFO. Primary reports written in English that encompassed qualitative descriptions of women’s non-adherence to hormonal therapy in the management of breast cancer were included. In total 21 articles published 2010-2018 were included. A first order interpretation of quotes (n= 767) in these publications was first completed and then compared against the original authors’ analyses. Quotations and interpretations were reinterpreted in NVivo using open, axial and selective coding to develop new categories. Causal conditions, actions/interactions, consequences and mediating factors were then identified for each of three emerging categories using the paradigm model. Discussion: It was possible to uncover a world of collectively shared experiences and understandings in this area by examining commonalities in existing published papers. The core category explained the difficulties women face with the initial decision to accept long term hormonal treatment and then the everyday challenge of continuing with the treatment or stopping it prematurely. 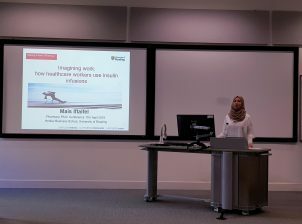 Oral presentation by final year PhD researcher, Mais Iflaifel, at the PhD Pharmacy Conference, April 2019, Henley Business School, University of Reading. Introduction: To achieve optimal blood glucose levels, intravenous (IV) insulin infusion is considered the treatment of choice for critically ill patients and non-critically ill patients who are unable to eat. An emerging approach to safety, called Resilient Health Care (RHC), proposes that it is necessary to understand in depth the variability in healthcare practitioners’ performance to help transition to a more adaptive organisation which is able to withstand every day clinical work changes and keep focus on how work can be performed successfully as well as how work has failed. This study will focus on one aspect of RHC, understanding how healthcare practitioners imagine work is performed. Aim: To explore and understand how healthcare practitioners use IV insulin infusions based on their knowledge of related guidelines. and activities described in the guidelines. Conclusion: A HTA was developed that showed a framework for analysing the use of IV insulin infusion. The output of the HTA was extremely useful and forms the input for the process of understanding RHC. Further research will explore how variables other than the guidelines might affect the control of blood glucose using IV insulin infusion. 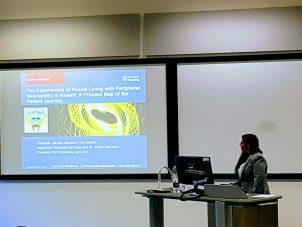 Oral presentation by second year PhD researcher, Melika Kalantari, at the PhD Pharmacy Conference, April 2019, Henley Business School, University of Reading. Achalasia is a rare motility disorder affecting the oesophagus. Due to the rarity of this condition, lack of information and knowledge and availability of different treatment options the management of this disease varies between individuals. Further research is required to examine the experiences of people with achalasia and its management to inform future patient care. In order to understand what people with this condition go through from when they first experience the symptoms it is important to explore their journeys through their care pathway. This study explores the patient journey of people living with achalasia and outlines the care pathway using a process map. Process mapping is an important way of understanding people’s experiences by separating the management of a specific condition into a series of steps. It helps to understand the process from the participants’ perspective and can also be used to facilitate change leading to improved quality of care. Fifteen people took part in a mapping session to share their journey and describe their experiences with achalasia. The data was then used to develop a template for the patient journey and develop a process map. Even though the onset of the disease differed between individuals, the subsequent process and steps experienced were broadly similar. Patients experienced similar symptoms at the beginning of their journey, and the majority had been sent for similar tests to obtain a diagnosis. The results of the mapping sessions indicate that most, manage their condition in similar ways, such as stress management and dietary changes. Variabilities arose between participants in terms of initial misdiagnosis and the treatments they were offered by the healthcare professionals. This research maps out the patients’ journey with achalasia, which to date has not been explored. Identifying the similarities and differences in the patients’ journey highlights the gaps where an intervention, to improve patient care, could be implemented. 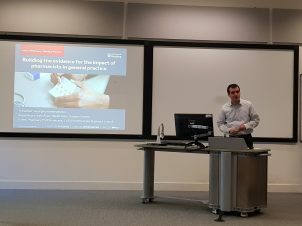 Oral presentation by final year PhD researcher, Georgios Dimitrios Karampatakis, at the PhD Pharmacy Conference, April 2019, Henley Business School, University of Reading. Background: Since 2015, there has been an initiative to integrate pharmacists into UK general practices as a new healthcare service for patients. The goal is to have one general practice-based pharmacist per 30,000 patients by 2020/21. Despite the existence of some generic national measures (key performance indicators – KPIs), little is known about the service’s impact on patients and the healthcare system. Objective: To identify strengths and limitations of the service (i.e. what works well and what does not, areas for improvement etc.) from the perspective of those involved. Methods: The project uses a mixed methods design. Focus groups were conducted with general practice-based pharmacists to identify problems with measuring their impact. An e-Delphi study was then undertaken to identify the activities that general practice-based pharmacists thought should be recorded. In-depth interviews with community pharmacists and patients were carried out to elicit their experiences of the service (patient interviews are yet to be completed). All qualitative data was analysed thematically and quantitative data from the e-Delphi study was reported as descriptive statistics. Analysis and reporting are still ongoing. Results: The national KPIs were deemed not to be fit for purpose in identifying pharmacists’ impact. Broad consensus was reached on a number of activities (disease specific and general medication reviews, medicines reconciliations and high-risk drug monitoring) viewed as the most important tasks to record for identifying general practice based pharmacists’ impact. Community pharmacists reported enhanced communication between themselves and their surrounding general practices as a result of pharmacists’ presence in general practice. Preliminary findings from patient interviews suggest that patients appreciate the opportunity for thorough discussions with pharmacists and, additionally, emphasize the importance of advertising the pharmacist’s role in this setting. Conclusions: Results will inform general practices and national policy on how to shape the service to best meet the needs and expectations of healthcare providers and patients. 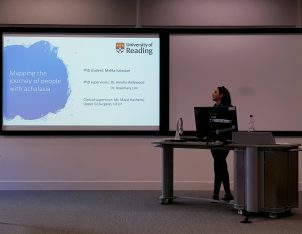 Oral presentation by final year PhD researcher, Maryam Alkandari, at the PhD Pharmacy Conference, April 2019, Henley Business School, University of Reading. Method: In this exploratory, qualitative study conducted in Kuwait, 25 subjects with peripheral neuropathy took part in a one-on-one semi-structured interviews lasting 45-60 minutes. Interviews were transcribed, translated and coded using NVivo 12. Four individual patient journeys were mapped out in detail, then compared and condensed into a single process map. The remaining 21 interviews were then reviewed to ensure the final map represented all patient journeys. The map was then compared to existing international standards. Results: Participants reported similar care pathways for their peripheral neuropathy and faced various difficulties; psychological (not receiving satisfactory care), medical issues (shortage of specialists) and administrative problems (long waiting referral periods). The process map identified that the current Kuwait system has similar pharmacological treatment guidelines to the UK. Major improvable gaps in care were apparent, however, including inadequate follow-up, waiting time, loss of medical documents, non-compliance with treatment protocols, variability in access to newer medicines, lack of patient awareness of the disease and its treatment, and poor communication between healthcare providers. Discussion: Mapping the current patient journey identified areas for improvement. When compared to UK standards, the map indicated the need for an integrated approach within the Kuwait medical team, the use of technology for electronic medical recording and report transmission, along with education for patients. Conclusion: Analysis of this pioneer patient journey map provided a strong strategic direction for the Kuwaiti healthcare system to address the patient experience in peripheral neuropathy.